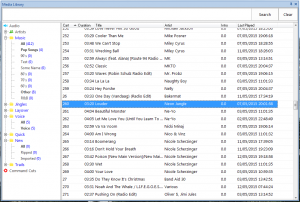 Autoplus Radio v.4.0 is a radio automation software product. It offers simple operation for both live assist and automated operation. 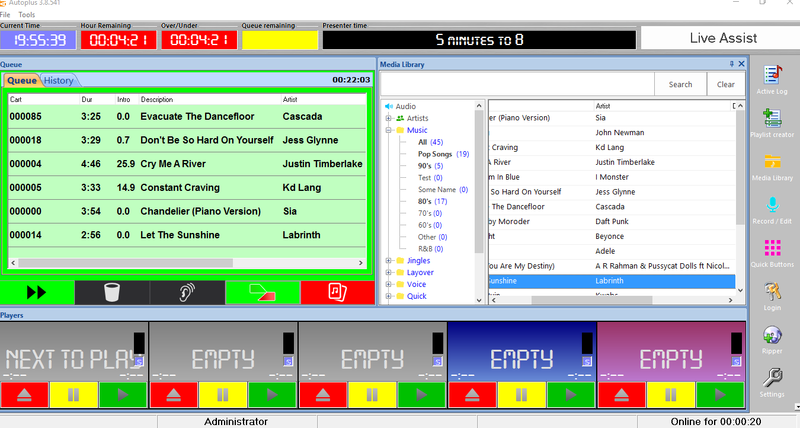 Autoplus Radio Automation Software is used by radio stations across the world, from the US to the UK, Nigeria to Russia. Easy to learn. Inexperienced users should be able to learn basic operation quickly. 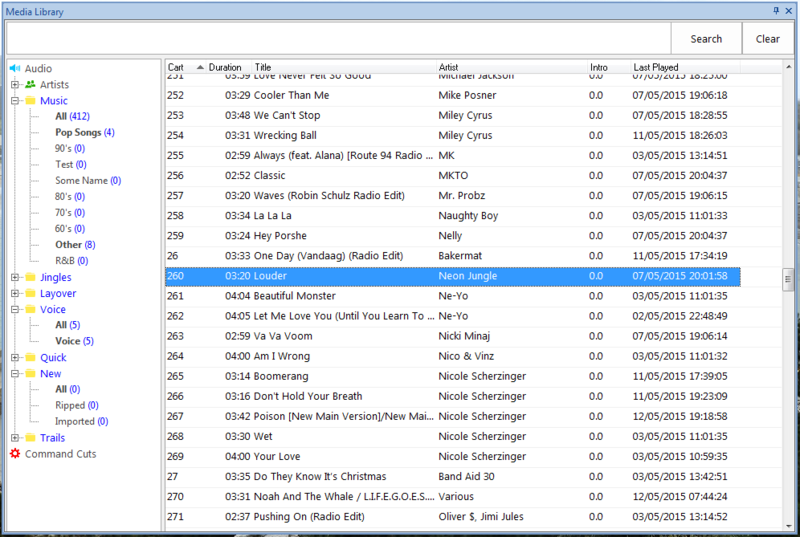 Comes with music scheduling, suitable for community/hospital/university/school radio. Flexible. Advanced functionality to allow for complex setups. Mix in satellite feeds, automatically import content from 3rd party providers and more. 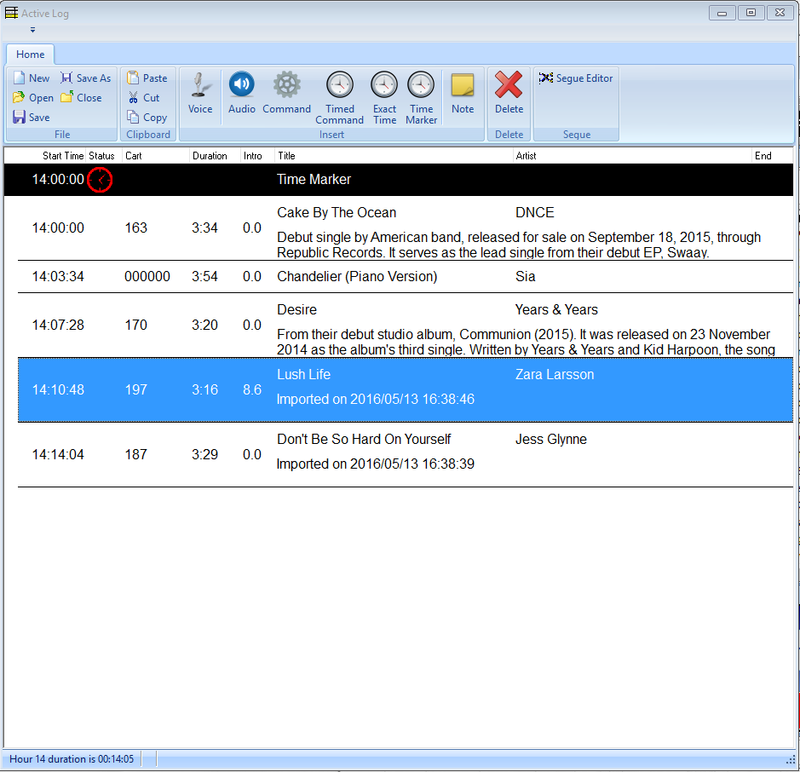 Autoplus radio automation software can work in a totally standalone mode, utilizing the included music scheduling. Alternatively playlists from more advanced music and commercial scheduling systems can be imported, edited and played with ease. Customers of any ability should be able to learn how to use Autoplus in a matter of minutes. Key information (current time, playlist remaining duration, etc) are shown at all times along the top of the screen. Colours are used alongside this information, helping to minimise on-air mistakes. Cart Decks are where audio can be played. It can be loaded, played, paused, resumed or stopped. The description and artist details are clearly displayed, along with progress indicators. 5 Cart decks are provided as standard (this is a configurable option). These can be positioned in either a horizontal or vertical stack on screen. Active Log brings together music, commercials and jingles and lets you easily browse and edit your entire playlist for a programme. Autoplus Radio Automation Software calculates the start time for each event on the playlist making it very easy to create accurate pre-recorded programmes. Every mix can be fine tuned using the segue editor. Using drag and drop to manoeuvre the mix, changing the way the playlist transitions. A visual audio waveform is displayed to aid with this process. Voice-tracks can be added at the click of a button. Voice-tracking within Autoplus is “in-context”. The operator hears the remainder of the previous track and the beginning of the next track while recording. This keep the presenters tone- of-voice in tune with the material surrounding it. Active Log also allows advanced timings to occur, such as automated news bulletins, switching of external feeds, etc. Quick Buttons let customers play audio instantly – with just one click! Click on the button and audio will play immediately. Multiple buttons can be played simultaneously. Audio is organised onto pages. Pages can either be per-user (only available to the logged in user), or global (available to all users). The number of buttons on each page can also be configured (on a per page basis). Quick Buttons are highly customisable. The colours can be set to make a visually appealing and presenter friendly layout. Audio can easily be added to the Quick Buttons using a drag and drop from the Media Library. Media Library is the heart of Autoplus. Audio carts can be browed and searched here. Advanced searching capabilities mean you can find the right audio in a large library within seconds. 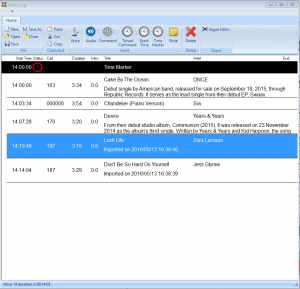 There are various methods of getting content into the radio automation software. There are times when you need to quickly ingest a single file or folder of content. 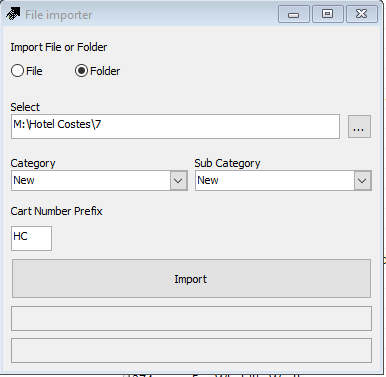 With Autoplus you can do this easily with the ‘File/Folder importer’. CD ripper lets you quickly ingest new material from the CD-ROM drive. Advanced features include automatic start of music and mix marker detection, plus normalization. As soon as tracks are ripped they’re broadcast ready. The Queue shows the up-coming items. It’s like a stack of CDs. Items can be rearranged as required. You can add an unlimited number of items into the queue and play them back in sequence. For automated sequences you can change the queue mode to ‘play through’ – where every track in the queue plays in sequence. The music scheduling module enables every station to control the rotation of music. 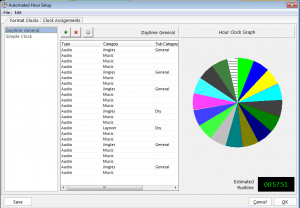 You can design how each hour of each day should sound, then leave Autoplus Radio Automation Software to pick the music for you. You can specify artist and title separation rules per category, the scheduler tries to respect these rules while scheduling your playlist. Another unique feature of Autoplus is ‘realtime’ scheduling. This allows radio stations to avoid pre-scheduling days of music, simply flicking the ‘auto-scheduler’ switch and walking away. Autoplus Radio Automation Software will then keep playing until you tell it to stop. You can set restrictions per audio cart to stipulate when it can and can’t be scheduled/played. 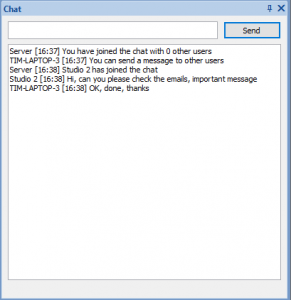 Autoplus Radio Automation Software has a built-in chat client, which can connect to our chat server. 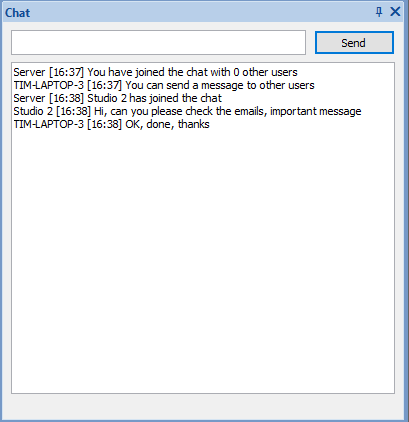 Using the chat functionality enables users across multiple studios and control rooms to communicate with each other. Autoplus supports Unicode languages. As demonstrated here, you can see the Cart Player with Russian text, also Greek text in the quick button. Searchable media library of audio and command cuts. Ability to mix any audio input to any audio output, allowing Autoplus to act as your satellite audio switcher. Audio capture, recording & import. 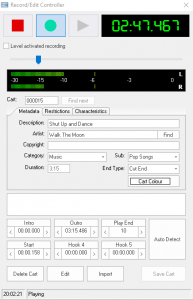 Display, create or import, modify and playback a playlist. Fully drag and drop environment (+ touch screen capable). Unlimited users with individual rights and system setup. Quick Buttons – configurable buttons per page, unlimited number of pages. Dedicated hardware for remote control available. Compatible with virtually any sound cards. Reads logs from music and traffic scheduling packages and exports audit logs.